Pupils weeding their food forest hub. This permaculture was trained by SCOPE. SCOPE’s aim is to expand the minds of communities by demonstrating to them that any land can be utilised to generate income and provide food alternatives. Their do this by targeting schools, offering demonstrations and training in their agricultural techniques. Currently, they work in 14 schools, which gives them a huge beneficiary reach as all the students and teachers gain feed supplements, training and income. 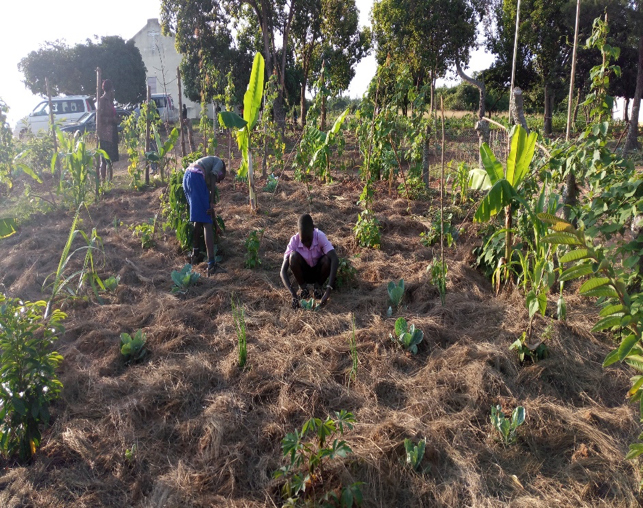 So far, 2,054 individuals have been positively impacted by SCOPE’s work and they have turned previously desolate land all over Masaka into blooming fruit and vegetable gardens. To ensure that they have the biggest impact, they target schools from which 55% or more of the students don’t have access to school lunches. These students are then the first to benefit from the yields of the school’s farm. To transform 3 school’s redundant land into thriving farms. To have 220 students gain access to school lunches every term across 3 schools by the end of 2019. SCOPE do all their work for the sustainability of the schools, their own running costs are funded through other work and their partnerships. This means that to continue their amazing work, they require capital to create the farms and provide follow up training and upkeep. Each farm costs £1,112 to implement and we aim to complete 3. These farms will be able to help feed school lunches to 146 students, which will have an incredible effect on their performance at school. With agriculture being the biggest employer in Uganda, learning skills like water harvesting can have a huge trickledown effect of teaching people how to transform desolate land. We can’t wait to see this in action!! 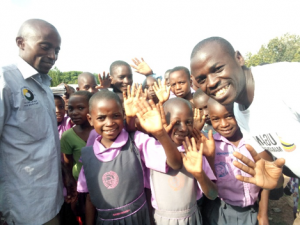 One story that really stunned the local community, was how the hard stony land at Butaaya Primary School was transformed into a food hub that now capably feeds their students. The farm now acts as an inspiring message to the community where many have now also turned their plots of land into food producing spaces for their families. It shows that any land can regain fertility and support growth which gives us all hope for the future of the planet.